Roche-Thomas Premium line of lubricants are formulated and bottled in our facilities using a special filtering process that eliminates impurities and residue. Our unique process insures that you receive a fast acting lubricant with a clean coat which is virtually dust and lint free. This is our newest and finest oil blend. It replaces our old valve oil, slide oil and rotary valve oil. This new blend is formulated to perfection. 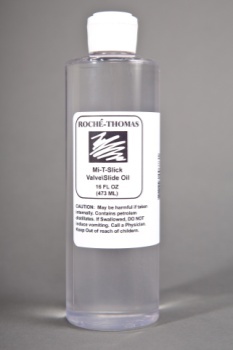 It has the perfect blend to make your instrument flow smoothly without residue resistance, die additives or other gimmicks our competitors try to use. Priced right for all musicians; formulated for the professionals. Comes in a 16oz cylinder bottle with a leak proof one piece cap that has a controlled dropper tip. Ideal for the economy shopper or repair departments. Here at Roche-Thomas we are proud to say that ALL aspects of our products are maunfactured in the USA so you know you are purchasing the finest products on the market.